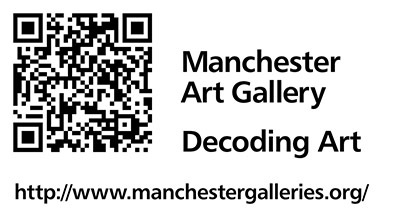 A QR code tag produced to attach to public sculptures in Manchester. Manchester City Galleries has responsibility for public sculpture in the city and wanted to extend knowledge and understanding in the uncurated spaces of public squares and settings in the city. Working with Martin Grimes, the Galleries’ web manager, the project 'Decoding Art' came about from a successful pilot in the ‘Revealing Histories’ display. QR codes mounted on Traffolyte laminate were placed next to a selection of public sculpture. 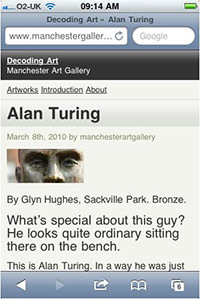 When captured by barcode reading software on smartphones the code took users to a web page featuring the sculpture. From this users could listen to a commentary from Jonathan Schofield, a well-known local tour guide, talking about the history of the piece and its context. Users could also comment on the work. The pilot had some interesting links with another to provide free public Wi-Fi in Albert Square. Martin Grimes's description of the Decoding Art project is at the UKOLN Cultural Heritage blog. Further pilot research involving Manchester Libraries was undertaken in 2011.